The human lysosomal cysteine proteases are a family of 11 proteases whose members include cathepsins B, C, H, L, and S. The biology of these proteases was largely ignored for decades because of their lysosomal location and the belief that their function was limited to the terminal degradation of proteins. In the past 10 years, this view has changed as these proteases have been found to have specific functions within cells. This review highlights some of these functions, specifically their roles in matrix remodeling and in regulating the immune response, and their relationship to lung diseases. Members of the papain family of cysteine proteases are found predominantly within the endosomal and lysosomal compartment of cells. It was initially believed that they were 'housekeeping' genes and that they functioned exclusively as the cell's garbage disposals, terminally degrading unwanted, abnormal, or endocytosed proteins. Recently this view has evolved as members of the family have been found to have distinctive patterns of expression (Table 1), have regulated expression, have important roles in specific biologic processes [1,2], and have been linked to inherited genetic diseases [3–5]. The first members of the papain family of cysteine proteases included cathepsins B, C, H, L, and S. During the past ten years six new members have been added, giving 11 (Table 1). Cathepsins B, C, F, H, O, and Z are constitutively expressed in most tissues. Although widely expressed, some of these proteases are found in significantly greater quantities in specific cells within tissues. Examples include cathepsin C (better known as dipeptidyl peptidase I or DPPI) (found in the greatest amounts in cytotoxic T lymphocytes , macrophages  and mast cells ), cathepsin K (osteoclasts, airway epithelium) [9,10], cathepsin S [antigen-presenting cells (APCs)], and cathepsin W (CD8+ T cells) . Structurally, members of the papain family of cysteine proteases consist of two domains folded together in a V-shaped configuration. At the bottom of the V, a cysteine and a histidine residue form the catalytic diad . Although their overall topographical structure is similar, each cathepsin has unique features that confer specific proteolytic activity on the enzyme. Cathepsins B and Z have a peptide loop overlying their active site that binds the C-terminus of proteins, making these cathepsins carboxypeptidases [13,14]. Cathepsin H is an aminopeptidase because a residual eight amino acids of the propeptide allows only the amino-terminal amino acid of a protein to access the active site . The aminodipeptidase DPPI is an oligomer and has a residual propeptide that probably blocks its active site as well . The endopeptidases cathepsins F, K, L, O, S, V, and W each have unique amino acids near the active site that confer their substrate specificity . These unique structural features and patterns of expression suggest that the enzymes have specific roles in the cells and tissues in which they are expressed. Two examples, which are the focus of this review, are their role in matrix remodeling and the regulation of the immune response. Many of the lysosomal cysteine proteases can degrade components of the extracellular matrix. An example of how well these enzymes degrade matrix components is their ability to hydrolyze elastin, a protein notoriously resistant to proteolysis. In fact, cathepsins K, L, and S are among the most potent elastases known . In vitro, cathepsin B reportedly degrades collagen type IV and X and fibronectin [17,18]. 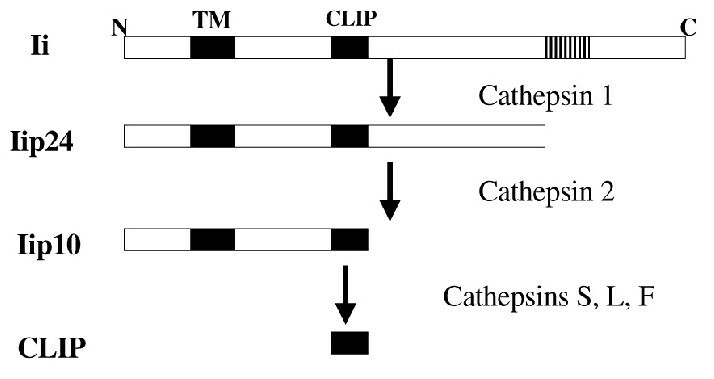 Cathepsins L, S, and K degrade fibrillar collagens , fibronectin, and laminin, and DPPI cleaves fibronectin and collagens type I, III, and IV . One basic requirement for matrix degradation in vivo is that the proteases must encounter the matrix molecule in a microenvironment in which the protease maintains its activity. This might occur intracellularly on phagocytosed matrix molecules, or extracellularly after secretion of the lysosomal cathepsin. The extracellular matrix of most tissues contains a vast network of different collagens. This mixture of collagens is not static; rather they are subjected to continuous degradation and turnover. For complete degradation, several proteases can act in concert both extracellularly and intracellularly [18,21]. Extracellularly, collagens can be degraded by collagenase, gelatinases A and B, stromelysin, and the cathepsins. Extracellular degradation of collagen can be incomplete, leaving fragments to be phagocytosed by cells such as fibroblasts, macrophages and smooth muscle cells . Within these cells, the collagen-containing phagosome fuses with lysosomes, in which cathepsins complete the degradation of the collagen molecules. This process of collagen phagocytosis and degradation can be regulated by hormones, cytokines and growth factors. Studies with periosteal fibroblasts have demonstrated that interleukin-1α and cortisol decrease the uptake of fibrillar collagen, whereas transforming growth factor-β enhances phagocytosis [22,23]. Furthermore, a decrease in collagen breakdown products is found in the culture medium when collagen phagocytosis and intracellular collagen digestion are reduced. A disease that illustrates the importance of intracellular collagen degradation is pycnodysostosis. Pycnodysostosis is an autosomal recessive disease caused by mutations of the gene encoding cathepsin K and is characterized by osteosclerosis, short stature, bone fragility, clavicular dysplasia, and skull deformities . These mutations result in an absence of cathepsin K activity and inadequate intracellular degradation of the organic bone matrix. This is demonstrated by ultrastructural examination of osteoclasts from affected individuals, showing vacuoles containing undigested collagen fibrils . Using pycnodysostosis as a model, it is reasonable to propose that a loss of cathepsin activity in resident lung cells might contribute to pathologic lung diseases, such as idiopathic pulmonary fibrosis, where decreased collagen phagocytosis and intracellular digestion lead to the build-up of collagen fibers in the extracellular space, favoring tissue fibrosis. In addition to the intracellular degradation of collagens, cathepsins can also degrade matrix proteins extracellularly. Before this action, the cathepsins must first be released into the extracellular space. Cells found to release cathepsins include macrophages (cathepsins B, L, S, and K) , mast cells (cathepsin L and DPPI) , smooth muscle cells (cathepsins S and K) , fibroblasts (cathepsin B), and tumor cells (cathepsins B, L, and S) . The two major mechanisms of release are altered trafficking of newly formed enzyme and regulated release from endosomes and lysosomes. Cathepsins are synthesized in the endoplasmic reticulum as pre-proproteins consisting of a signal peptide, a propeptide and a catalytic region of the enzyme. The signal peptide serves to target the cathepsin to the Golgi apparatus, where it is glycosylated with high-mannose carbohydrates. These carbohydrates bind to one of the two mannose-6-phosphate receptors and the complex is transported to the prelysosomal compartment, where the acidic environment causes dissociation of the enzyme-receptor complex and activation of the enzyme. In some disease states, a decrease in affinity for, or number of, mannose-6-phosphate receptors can result in mistrafficking and secretion of cathepsins. Examples include the observation that pro-cathepsin B released by some tumor cells has a different glycosylation pattern from that of control cells , and that a decrease in the number of mannose-6-phosphate receptors in transformed mouse squamous-cell carcinoma cells results in the secretion of cathepsin B . However, there are probably alternative explanations for the mistrafficking of cathepsins, because recent reports have suggested that mechanisms independent of mannose-6-phosphate exist for the targeting of cathepsins to lysosomes . The regulated release of lysosomal contents is a second mechanism by which cathepsins can be secreted from cells. Many cells of hematopoietic origin (T-cells, neutrophils, and mast cells) have secretory granules that are released in a regulated manner when their contents are needed to destroy target cells (T-cells), or to control a bacterial (neutrophil) or parasitic (mast cell) infection. These cells also have granules that can be identified as lysosomes by the presence of lysosomal markers (for example, lysosomal-associated membrane protein [LAMP] and vesicle-associated membrane protein [VAMP]-2 or cathepsins). In mature hematopoietic cells, many granules contain both lysosomal and secretory markers and seem to have dual functions (that is, secretory lysosomes) . Functionally, these doubly labeled granules act as lysosomes and secretory granules, and release both their secretory and lysosomal constituents when the cells are activated to do so. Examples include the release of DPPI by natural killer cells and mast cells [8,32], and cathepsins B, L, K, and S by macrophages . The secretion of lysosomal contents does not seem to be limited to 'secretory lysosomes' of hematopoietic cells and might be a feature of lysosomes in other cells. This is supported by the recent observation that smooth muscle cells stimulated with interferon-γ synthesize and secrete cathepsin S . Similarly, the activation of fibroblasts by calcium ionophore causes the release of lysosomal β-hexosaminadase . Thus, the regulated secretion of lysosomes is a feature of many cells and might represent a primitive secretory function in these cells. The observation that lysosomal contents are released by increasing the intracellular concentration of Ca2+ ions is intriguing and might provide a clue to the mechanism of how this occurs. An understanding of how secretory granules are released has been developing for several years . One of the basic mechanisms involved is the interaction of proteins integrated into the membrane of secretory vesicles (v-SNAREs; SNARE stands for soluble N-ethylmaleimide-sensitive factor-attachment protein receptor) with proteins integrated into the target cell membrane (t-SNAREs). The interaction of these proteins seems to promote membrane fusion by bringing the secretory vesicle into close apposition with the outer cell membrane. An example of this phenomenon is the Ca2+-dependent release of neurotransmitters triggered by the interaction of the v-SNARE synaptotagmin I with the t-SNAREs syntaxin and SNAP-25 (in which SNAP stands for soluble N-ethylmaleimide-sensitive fusion protein attachment protein) . After depolarization, intracellular concentrations of Ca2+ ions increase within the nerve. Ca2+ ions then bind to Ca2+-binding regions on synaptotagmin I (C2-domains) , giving the molecule a more positive charge and facilitating an interaction with the negatively charged t-SNAREs (for example, syntaxin 1) and phospholipids on the cell surface. Of the 11 members of the synaptotagmin family, synaptotagmins I, II, III, V, and X are expressed exclusively in the nervous system . The others are expressed ubiquitously, suggesting that they have functions that are more general in non-neuronal cells. One possibility is that, similarly to the regulation of neurotransmitter release by synaptotagmin I, specific synaptotagmins might also regulate the release of lysosomal constituents from non-neuronal cells. This is supported by a recent study reporting that synaptotagmin VII regulates the Ca2+-dependent exocytosis of lysosomes from normal rat fibroblasts . Lysosomal constituents, including cathepsins, can therefore be released from many cells, and this exocytosis might be regulated by v-SNAREs and t-SNAREs, including the synaptotagmins. Most cathepsins have optimal activity at an acidic pH and lose their activity quickly at a neutral pH (exceptions include cathepsin S and DPPI) [8,38]. Consequently, to maintain their activity extracellularly, the cathepsins must also be released into an acidic environment. This might occur in pathologic conditions, such as pyogenic infections or malignancy, which are known to be associated with acidic extracellular environments. In these disease states, the acidic environment is due to several factors associated with the disease process as a whole rather than an individual group of cells that release the cathepsins. In other circumstances, cells releasing cathepsins might promote extracellular proteolysis by directly acidifying the pericellular space in which the cathepsins are released. One example, reported by Punturieri et al , is the acidification of the pericellular environment by macrophages during elastinolysis. In vitro, monocyte-derived macrophages adhere tightly to elastin particles and form a sequestered environment between the cell membrane and the elastin particle to be degraded. The macrophage then acidifies this pericellular space by using a vacuolar type H+-ATPase to pump protons from the cytoplasmic space to the extracellular space. Concurrently, the macrophage releases elastinolytic cathepsins L, S, and K into the acidic microenvironment, where they can degrade the elastin. Furthermore, these tight junctions might also promote extracellular proteolysis by cathepsins in vivo by preventing the interaction of secreted cathepsins with cysteine protease inhibitors, such as cystatin C, that are found in all tissues and body fluids. Lung cancer or chronic inflammatory conditions such as asthma, emphysema, and idiopathic pulmonary fibrosis are lung diseases in which the regulated secretion of lysosomal cathepsins might be important in disease progression. In lung cancer, degradation of the stroma surrounding tumors by cathepsins might promote the growth and metastasis of lung cancer. This is suggested by findings in vitro that non-small cell lung carcinomas secrete cathepsins B and L , that squamous cell carcinomas can invade matrigel (a surrogate of extracellular matrix), and that this invasion can be inhibited by heterologous expression of the cysteine protease inhibitor cystatin C . Although data in vivo supporting a role for cathepsins in tumor progression are lacking, the study of tumor models in cathepsin knockout mice should provide more definitive answers in the future. Emphysema is characterized by the proteolytic degradation of lung extracellular matrix, especially lung elastin. The elastinolytic cysteine proteases cathepsins K, L, and S might be important in this process . As discussed above, two highly abundant cell types in the lung, macrophages and smooth muscle cells, can synthesize and secrete cathepsins K, L, and S, which might then degrade lung elastin. Recent studies suggest novel mechanisms by which this might occur. Elias and colleagues have established transgenic murine models of inducible expression of cytokines along alveolar surfaces (with the murine CC10 promoter). Remarkably, the induction of interleukin-13 (IL-13) overexpression in mice six to eight weeks old results in alveolar space enlargement and a loss of alveolar attachment sites, morphological hallmarks of emphysema, on a timescale of weeks to months . Increased levels of both active metalloproteases and cysteine proteases develop along the alveolar surfaces and presumably in lung tissues. Mice given the cysteine protease inhibitor E64 or leupeptin have markedly attenuated emphysematous changes, implying an important role for cysteine proteases in IL-13-induced emphysema. It is noteworthy that matrix metalloprotease inhibitors also attenuated the process, indicating the probable involvement of multiple enzyme systems. The fact that these cytokines affect both mesenchymal and hematopoietic cells suggests that not only macrophages but also multiple cells in the cytokine-exposed lung might contribute to tissue cathepsin activity, underscoring the complexity of matrix remodeling in this disorder. Whether IL-13 or other cytokines already shown to induce the secretion of elastinolytic cathepsins (for example, interferon-γ) promote emphysema and COPD in cigarette smokers remains to be established. Lysosomal cysteine proteases can be important for the regulation of innate immunity. An example is the activation of granule-associated serine proteases (namely, neutrophil elastase, cathepsin G, granzymes A and B, and mast cell chymase) by DPPI. These enzymes are synthesized as proproteins with a two-residue propeptide (or activation dipeptide) that maintains them in an inactive conformation. Proteolytic removal of the activation dipeptide induces a conformational change and activation of the serine protease. The activation dipeptides of the granule-associated serine proteases are similar, suggesting that they might be removed by the same protease or proteases . Because of DPPI's amino-terminal dipeptidase activity, it was a logical candidate for an activator of these serine proteases. By using a DPPI-specific inhibitor, or recombinant proenzymes, it was shown that DPPI could activate neutrophil elastase, cathepsin G, granzymes A and B, and mast cell chymase in vitro [42,43]. To test this possibility in vivo and to determine whether other proteases could compensate for DPPI's activity, DPPI knockout mice were generated . In characterizing the protease activity in leukocytes of these animals, it was found that DPPI is essential for the activation of granzymes A and B. This absence of DPPI activity, and consequently serine protease activity, has been shown to have important biologic consequences in both mice and humans. By activating granzymes A and B, DPPI might regulate the lymphocyte-mediated cytotoxicity of virally infected or malignant cells . Cytotoxic T lymphocytes and natural killer cells eradicate abnormal cells by the simultaneous release of granzymes A and B and perforin. Perforin forms a pore in the target cell through which the granzymes pass. Once inside the cell, the granzymes trigger apoptosis directly by activating the caspase cascade (granzyme B) or by other less well defined processes (granzyme A). DPPI might also have a role in defense against Gram-negative bacterial infections in mice by activating neutrophil elastase. Neutrophil elastase then destroys Gram-negative bacteria by hydrolyzing outer-membrane protein A on their cell walls [46,47]. Therefore, by regulating the activity of serine proteases DPPI is important in the primary host defense against both bacterial and viral infections in mice. DPPI also seems to be important for the primary host defense in humans. This is suggested by recent findings that patients with Papillon–Lefèvre syndrome have mutations of the gene encoding DPPI and an absence of DPPI activity [3,5]. Papillon–Lefèvre syndrome is a disease characterized by early periodontitis, skin hyperkeratosis and a predisposition to bacterial infections such as pneumonia, liver abscesses, and furuncles. Although exact explanations for these phenotypic features are currently unknown, findings in the DPPI knockout mice suggest that the general susceptibility to bacterial infections may be due to decreased amounts of neutrophil elastase and cathepsin G activities . Furthermore, periodontitis might also be due to a subclinical infection. The pathogenesis of the hyperkeratosis is unexplained but suggests that DPPI might have a role in cell growth or in matrix degradation. Endosomal proteolysis directs the efficiency and character of major histocompatibility complex (MHC) class II-dependent antigen presentation by fulfilling two important roles: generation of antigenic epitopes and degradation of the invariant chain (Ii), an MHC class II-associated molecular chaperone [48,49]. Ii binds to the peptide-binding groove of newly synthesized MHC class II α/β heterodimers, preventing their premature association with endogenous polypeptides, and promoting, by means of a cytoplasmic endosomal targeting sequence, Ii/MHC class II trafficking through the endosomal compartments of APCs. Within these compartments, the Ii luminal domain undergoes stepwise proteolytic degradation to smaller fragments (Fig. 1). Invariant chain (Ii) undergoes stepwise C-terminal degradation to generate class II-associated invariant chain peptide (CLIP), which occupies the peptide-binding groove of major histocompatibility complex (MHC) class II molecules until its exchange with antigen peptides. The figure depicts distinct intermediates in Ii chain processing, leading to the formation of CLIP. Ii undergoes progressive carboxy-terminal processing within endosomes by distinct cysteine proteases to generate CLIP. The enzymes responsible for the generation of Iip24 and Iip10 remain to be defined, although in purified form cathepsin S can generate CLIP from intact Ii. Mice deficient in cathepsin S accumulate Iip10 but not Ii or Iip24 in their B cells and dendritic cells, implying that additional important enzymes in this process remain to be defined. The first major intermediate, Iip24, interacts avidly with MHC class II and is not easily displaced by peptide. Iip24 accumulates in human APCs treated with the cysteine protease inhibitor E64 [50,51]. The smallest fragment containing both the retention sequence and the C-terminal extension through the class II peptide groove has been termed Iip10. Iip10 is converted subsequently to CLIP (a roughly 3 kDa class II-associated invariant chain peptide). CLIP-bearing MHC class II molecules are now mature and competent to load peptide because CLIP, but not larger fragments of Ii, rapidly dissociates from MHC class II dimers in the presence of a second MHC-like molecule, HLA-DM, within endosomal compartments [52,53]. Thus the endosomal proteolysis of Iip10 to CLIP generates the substrate for HLA-DM and allows the efficient loading of MHC class II molecules with peptides generated from endocytosed protein. Once free from endosomal retention, peptide-loaded MHC class II dimers move to the cell surface. As indicated in Table 1, cysteine proteases are of two general types: exopeptidases (aminopeptidases and carboxypeptidases) and endopeptidases. Endocytosed proteins are fragmented by endoproteases and then repeatedly 'trimmed' by the exopeptidases to yield an antigenic epitope (see Fig. 2). Schematic summary of the role of endosomal proteases in antigen presentation. Both endoproteases (a) and exopeptidases (b, c) contribute to terminal degradation of internalized protein. The figure emphasizes that the progressive fragmentation of an internalized antigen (depicted in gray) is regulated by two separate processes: the presence of antibody and the ability of mature MHC class II to complex with free peptides. Antibodies greatly enhance the efficiency of antigen uptake and alter antigen processing . Mature MHC class II molecules bind peptides and direct these complexes to the cell surface . That specific cleavages in antigens are crucial to antigen presentation was recently confirmed by Watts, who reported that the mutation of a single asparagine residue in tetanus toxin blocked cleavage by the asparagine-specific endosomal enzyme legumain and abrogated further processing to antigenic peptides . 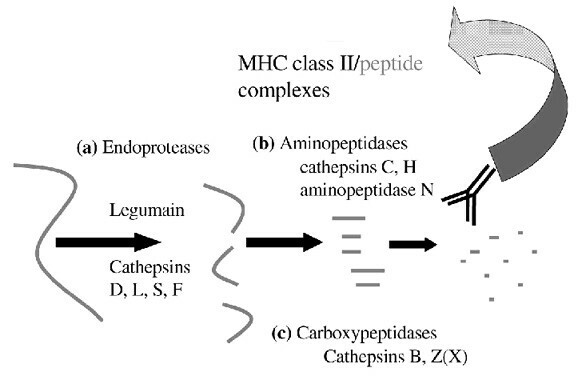 Thus, the manner in which endocytosed proteins are initially fragmented, whether by legumain or other endoproteases, is potentially an important determinant of the display of MHC class II peptides. One function of antibodies in this process is in directing the trafficking and degradative process leading to antigen presentation . Both the efficiency of antigen capture and the process of antigen degradation are modified by the presence of specific antibodies. As alluded to above, antigen presentation is also intimately linked to the timing of MHC class II maturation, which is itself linked to Ii proteolysis, because the peptide groove functions to protect potential epitopes from terminal degradation . Given time, most if not all epitopes free in solution will be destroyed. Thus, efficient antigen presentation requires mature MHC class II molecules to be in the right place at the right time. The limited time during which free peptides can encounter mature class II peptides before degradation might contribute to the capacity of proteins that can persist in the lysosomal compartment, such as the mite cysteine protease Derp1, to be particularly immunogenic. As both antigen processing and MHC class II maturation are crucially dependent on specific proteases, perturbation of the activity of specific proteases within the antigen-presenting compartment could modify antigen presentation. Conceivably, this could be exploited to control MHC class II-driven disease processes in the lung, such as sarcoidosis and asthma. Recent studies support this notion. In previous work the availability of a relatively specific inhibitor of cathepsin S, leucyl-homophenylalanine-vinylsulfone (LHVS), was used to establish that cathepsin S has an essential role in CLIP formation by B cells . This was subsequently verified by targeting the gene encoding cathepsin S . Splenocytes from 'knockouts' of cathepsin S fail to process Ii beyond Iip10 (Fig. 1) and have defective TH-1-dependent immune responses. However, further analysis of these mice revealed a surprise. Cathepsin S 'knockouts' immunized with ovalbumin developed normal IgE responses and exhibited the same or greater pulmonary eosinophilia in response to inhalation of ovalbumin as did wild-type mice. This result was completely different from that observed when normal mice were administered relatively high doses of LHVS. Mice given LHVS during immunization with ovalbumin had virtually completely suppressed IgE responses and pulmonary eosinophilia . LHVS also abrogated IgE and lung eosinophilia when given to cathepsin S-deficient mice. To explore this discrepancy, cathepsin S and L double 'knockouts' were generated and MHC class II maturation was studied in these mice. Surprisingly, lung macrophages (but not splenocytes) from cathepsin S/L knockouts hydrolyzed Iip10 and loaded peptide normally. However, macrophages exposed to relatively high doses of LHVS (1 μM) accumulated Iip10 and failed to load peptides efficiently. This implied that an LHVS-inhibitable cysteine protease(s) does in fact mediate Iip10 processing independently of cathepsin S/L and does so preferentially in macrophages (and potentially myeloid-like dendritic cells). This finding led to the discovery that another member of the cathepsin L-like subfamily of endoproteolytic cysteine proteases, cathepsin F, is expressed preferentially in macrophages and efficiently mediates the degradation of Iip10 to CLIP . Thus, different APCs have distinct pathways of antigen processing and MHC class II maturation. These observations also suggest that macrophages could have a larger role in antigen presentation pertinent to asthma than is currently believed. An important area for further research will be to determine whether the selective inhibition of cathepsins S, L, and F or, alternatively, the exopeptidase group of cathepsins B, H, and X favorably influence the immune response in the lung. With the use of specific inhibitors and genetically modified mice, our understanding of the importance of lysosomal cysteine proteases has advanced considerably in recent years. It is now evident that they regulate biologic processes such as matrix remodeling and the immune response. Although their exact roles in the pathobiology of lung diseases are uncertain, continued research in vivo with animal models and samples from patients with lung disease should clarify their roles in this area. Supported in part by grants HL-04055 and HL-48261 from the National Institutes of Health.